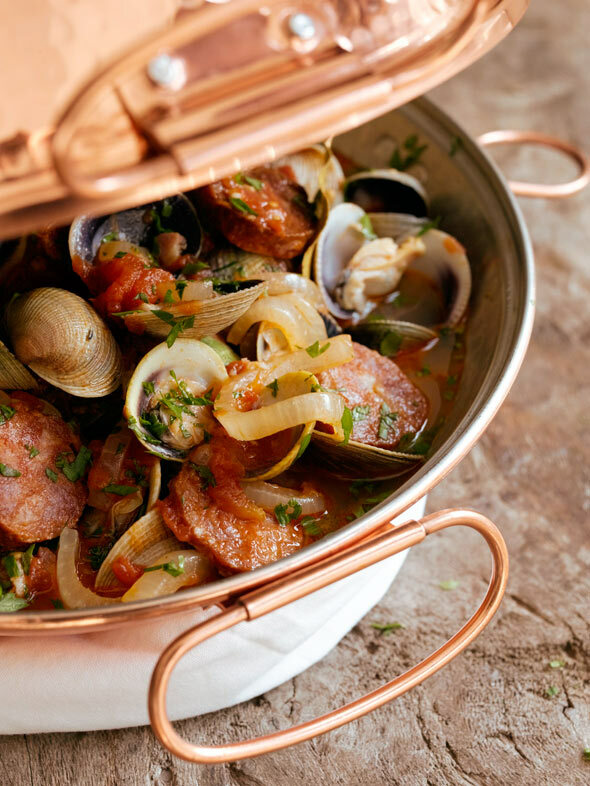 A cataplana, a fixture in the Algarve, is kind of a spiritual cousin to the pressure cooker. Shaped like a giant clam, the hinged pan clamps down during cooking, locking in the juices of its contents. When carried to the table and popped open, it fills the room with steam redolent of the sea. If you’re bereft of a cataplana, a Dutch oven with a tight-fitting lid works perfectly, if less attractively. 1. Heat the oil in a large cataplana or a pot with a tight-fitting lid over medium-high heat until it shimmers. Dump in the chouriço (or dry-cured Spanish chorizo) and presunto (or Serrano ham, prosciutto) and cook, stirring occasionally, until touched with brown, 6 to 8 minutes. 2. Lower the heat to medium; drop in the onions and bay leaf, and cook, stirring occasionally, until the onions are soft, 5 to 7 minutes. Add the garlic and cook for 1 minute more. Stir in the tomatoes and any accumulated juice, the wine, and paprika. Discard any clams that feel heavy (which means they’re full of sand), have broken shells, or don’t close when tapped. Plonk the clams into the pot and turn the heat to high. If using a cataplana, lock it and cook 5 to 10 minutes, shaking occasionally, until the clams open. If using a Dutch oven, cook, covered, stirring occasionally until the clams pop open, 5 to 10 minutes. 3. Carry the cataplana triumphantly to the table, making sure everyone’s watching, then release the lid. Bask in the applause. Toss out the bay leaf andany clams that refuse to open. Season with a few grinds of pepper, shower with parsley, and ladle the stew into wide shallow bowls. Oh, and have a big bowl on hand for the shells. Clams and Sausage in a Cataplana Recipe © 2009 David Leite. Photo © 2009 Nuno Correia. All rights reserved. All recipes and photos used with permission of the publisher. Here they are: “The CLAMS!” This dish looked amazing on the TODAY Show; the clams sounded succulent and saucy being dished out of the cataplanas… and now LC readers get to make this at home. It isn’t national television, but I’ll take what I can get–and love it! Thanks for sharing the recipe here. Looks fabulous. 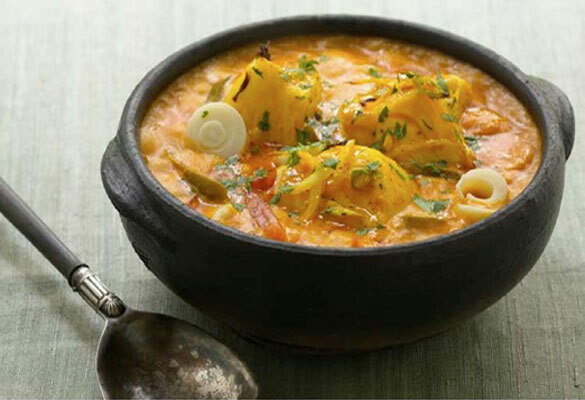 What other recipes do you have using the cataplana. I would like to make more use of mine. Maureen, anything that requires an initial searing and subsequent steaming is good for a cataplana. 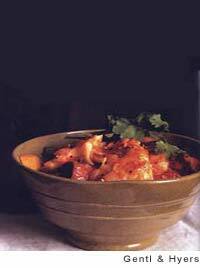 So think things that can cook quickly and lightly: fish stews, shellfish soups, brothy dishes, etc. If you can get your hands on “Cataplana Experience,” a book my Fátima Moura, it has an amazing collection of recipes from clams to foie gras. That book is available here, but it will cost just under $100 with shipping. Thanks, Robert. Yes, it is costly, sadly. I love cataplanas, once I had a swordfish one, near Sesimbra. Delicious. I am as enamored of that beautiful copper pan as I am of the recipe! Love how you’ve managed to include both practical knowledge about the cataplana and some personal stories in such a succinct post. First, I heard you had your folks on the Today show..I would love to see it if you can direct me to a post. I just watched the segmant from channel 8. As I noticed a flip of your hand, I was reminded of your portrail of “Marco the Magnificant” in our high school production of “Carnaval”…I always knew that you would be more magnificant. I am a little jealous and a lot proud. Hey, Greg. My parents actually weren’t on the Today Show—it was only me. You can find the post here. And thanks for the comments; always appreciated! Hi! I love cataplana, and actually had a similar experience in the Algarve (though at Praia de Castelejo, just a short jaunt down the road from Sagres). I raved about it so much that my Mom got me a cataplana pan for Christmas, but besides a few cataplana stew recipes here and there I can’t find many other things to do with the pot. I’m guessing the book you mention (Fatima Moura’s The Cataplana Experience) is just what I need, but I can’t find it anywhere. Do you know where I can get a copy? It only seems right that someone in my (Portuguese) family be able to cook a few traditional meals! Thank you!! Lea, I totally agree: Being Portuguese, you need to cook the traditional foods of your heritage. They only thing it’s a bit tricky to find the book in America (although the recipes are in English in the back of it). You can buy it at Portugal’s famous bookstore FNAC, but i’m not sure if they ship to America. You can drop them a line or call them, if you have a program such as Skype. I made this tonight and it was absolutely amazing! I also ordered your cookbook which can be found on Amazon with prime shipping! Obrigado! Lora Z, parabéns! So glad you like it. It’s one of my favorite recipes from the book. And, yes, it can be shipped using Amazon Prime–no more waiting. Lora Z, you found my favorite recipe! David – sorry for the delay in my reply, but I just wanted to let everyone know that I found the book at both FNAC and WOOK.pt, where I ordered it from as it was in stock, and they shipped to the US with no problem. It has a ton of recipes – can’t wait to try out the lobster ones! Lea, wonderful! How did the recipes turn out? My parents just returned from Portugal this week and surprised me with my very own cataplana. (I love saying that word out loud!) I must say I am very excited, curious, and, most of all, intimidated by it! Glad I could come straight here to get some ideas (other than clams Alentejana) and will be looking into getting “The Cataplana Experience.” As always, you come through for me! Thank you for pointing me in the right direction! Congratulations, Renee. And it does kinda roll of the tongue, doesn’t it: cah-tah-plaaaaaaaah-na. And there’s nothing to be intimidated about. Honest. It’s a wonderful cooking utensil that you’ll get years of pleasure from! Hi, David. 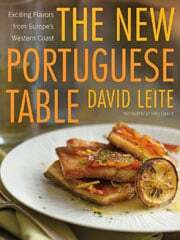 Just got back from Lisbon last week and was missing the fabulous food, so decided to try this in a pressure cooker. It worked great! I followed all the steps up until locking the cataplana, then sealed the pressure cooker, turned up the heat to bring it to the right pressure, and let it cook for 3 minutes. I also included mussels and shrimp in mine. Thanks for the inspiration, it was delicious! Hey, Tina. That is great. So glad it worked. Any photos by any chance? Sadly, no photos. But when I make this again (and I will), I’ll take a shot to post. In the meantime, a request: Do you have a recipe for arroz de mariscos? That was another favorite from the trip that I am already missing. Tina, I don’t personally, but there are, of course, tons on the Internet. Just make sure what ever you do, you use a very good and strong shrimp/shellfish stock for the rice. It makes all the difference. Hi, Tina. If the handle didn’t close completely, that could be the culprit. Also, copper cataplanas can dent easily. What I’d do in the future is cook it as written, but either 1.) don’t flip but rather shake the pan a lot, or 2.) turn off the heat, wrap a dish towel around the rim of the pan, and flip quickly. Thanks, David, I’ll try that!